As summer approaches, and the further we get away from the Thanksgiving and Christmas holidays, area food banks shelves steadily become depleted. 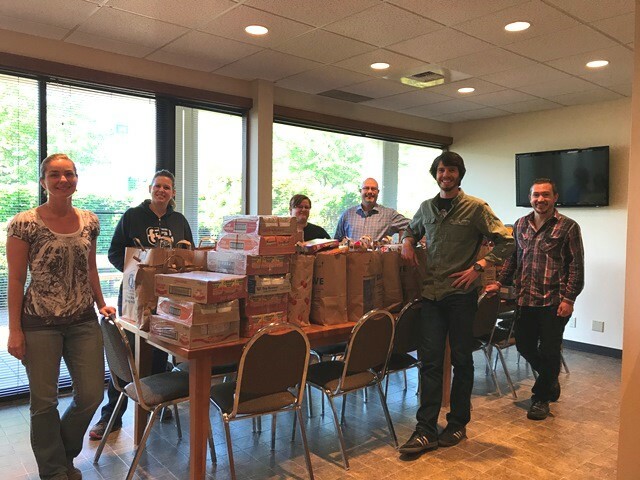 Each year LDC Inc., in cooperation with the Woodinville Storehouse Food Bank, conducts a company food drive to help restock those shelves. The Storehouse Food Bank supports over 200 families in the Bothell, Kenmore, Kirkland, Woodinville, and Redmond areas. By focusing on a less traditional time of year to donate LDC is working to close the gap of hunger for those that need it any time of year. This year LDC Inc. split into 5 equal groups made up of department teams to see which team could donate the most items. At the end of the competition we pooled all donations and delivered to the food bank. Due to our competitive nature to win, the departments each had incredible donations and in total we were able to donate over 1440 food items to help those in our local community. Kudo’s to the 2017 winning team – Team Telecom. We’ll be ready for you next year!